Ever wondered how your own selfies compare against the internet’s vast amount of artistically crafted narcissism-laden self portraits? Turns out, there’s an AI for that. 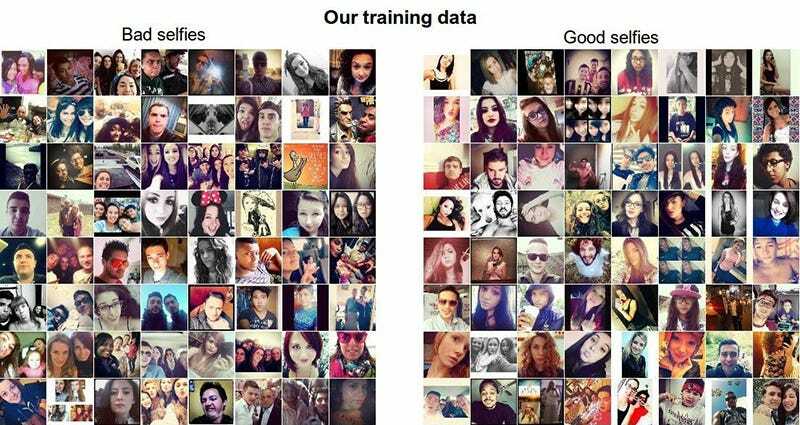 Feeding two million internet selfies into a “140-million-parameter state-of-the-art Convolutional Neural Network,” a Standford PhD candidate has trained an AI to classify “good” selfies from “bad” ones. Convolutional Neural Networks, ConvNets for short, are often used to recognize objects, places and people in photos by following common patterns. Filtering five million internet images tagged “#selfie” down to images containing only one face, the software was left with about two million images. The neural network was trained to evaluate whether a selfie was “good” or not by looking at how many likes these selfies had on social media (the blog post notes that they controlled for the number of followers). Karpathy’s program then analyzed these images by breaking down each one into layers of shapes and colors. Then, taking 50,000 new selfies–ones that ConvNet hadn’t seen before–they watched as the program perused the images before making a decision about which ones people would like. It found that we prefer female selfies. Specifically females with long hair, slightly tilting their head while the top edge of the frame cuts off their forehead. A smaller forehead and longer hair may be more desirable because it reminds us of younger women. And as expected, we also like filters, over-saturated faces, and borders. Men got the short end of the stick here. In a list ConvNet made, men didn’t even make the top 100 “good” selfies cut. The good news is that men don’t have as many selfie standards to follow. ConvNet found that the most popular mens photos showed them having their full head and shoulders in the shot. Sporting a fancy hairstyle that’s slightly longer and combed upwards did well, too. ConvNet does have some selfie-dont’s that include taking pictures in low lighting, in large groups, or with your head framed too large. If you’re curious to how your selfie stands up, tweet it to the network’s Twitter bot. It claims to have a 60 percent accuracy rate while giving you results in under a minute.